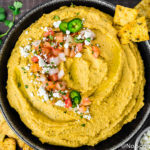 Savory, smoky and slightly spicy, this flavorful Easy Fajita Hummus Dip recipe tastes exactly like everything you love about fajitas, just blended into healthy, creamy, dreamy dip form! Get creative with your fajitas and turn them into a drool-worthy dip! 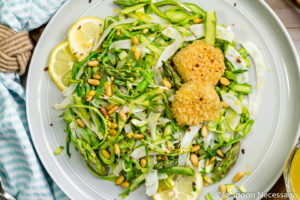 This post was originally published in April 2016. 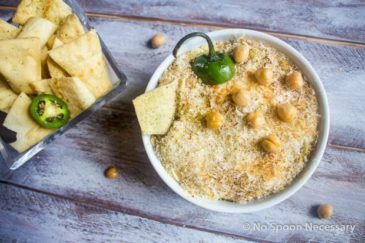 I edited the photos, tweaked the recipe slightly and updated the post below to include more information about this Easy Fajita Hummus dip recipe. 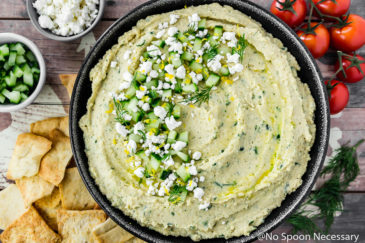 Plus, I added a recipe video to show you how easy this healthy hummus dip is to make! Mine was delightful. It was filled with the perfect amount of food blog related shenanigans and relaxation. Balance, when it is achieved it really is a lovely thing. Anyways, I have a confession to make. I actually made today’s hummus for the first time back in December, and I’ve made it more times than I can count since then. I had planned on sharing this with you in January, but I got caught up in healthy winter things. And then, all the Valentine’s Day things. And then, I got scared winter was going to come to an abrupt halt because Punxsutawney Phil didn’t see his shadow, so I hopped immediately back on board the cozy winter dish bandwagon. And then, Easter started to approach and demanded recipes be shared. And then, spring produce started to show up and blew my skirt up. So here we are… April. And I’m just now sharing this recipe with you. You could say I’m easily distracted. And I can’t stick to an editorial calendar to save my life. Or, you could say many things popped up in the food-blog-esphere that required my immediate attention. But, don’t let my blonde haired, easily distracted, seasonally focused self fool you. 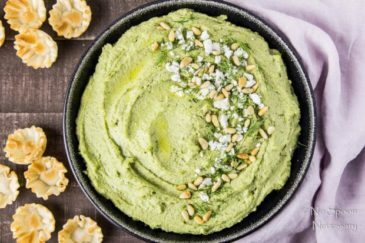 This easy hummus recipe is the jam. 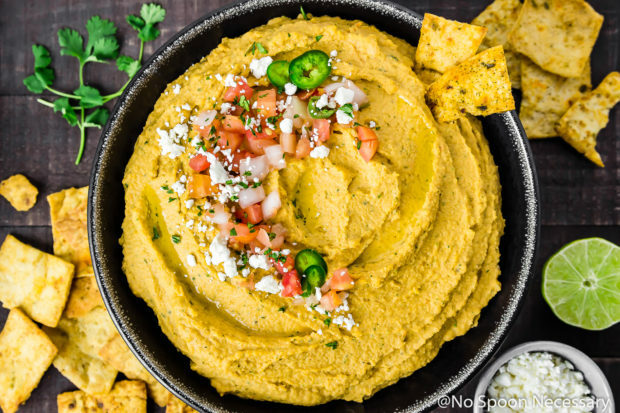 Savory, smoky, slightly spicy, and herbaceous, this fajita hummus tastes like everything you love about fajitas… just blitzed into a creamy, smooth and healthy dip. Boy detests hummus, (<– yes he is certifiably crazy, but about to redeem himself in 3, 2, 1… –>) and he absolutely loved this hummus. Now, I have made maaaaany different unique flavors of hummus over the years, and he was quick to tell me they were all okay, but he’s not changing his mind about chickpeas. How to make your own Fajita seasoning? 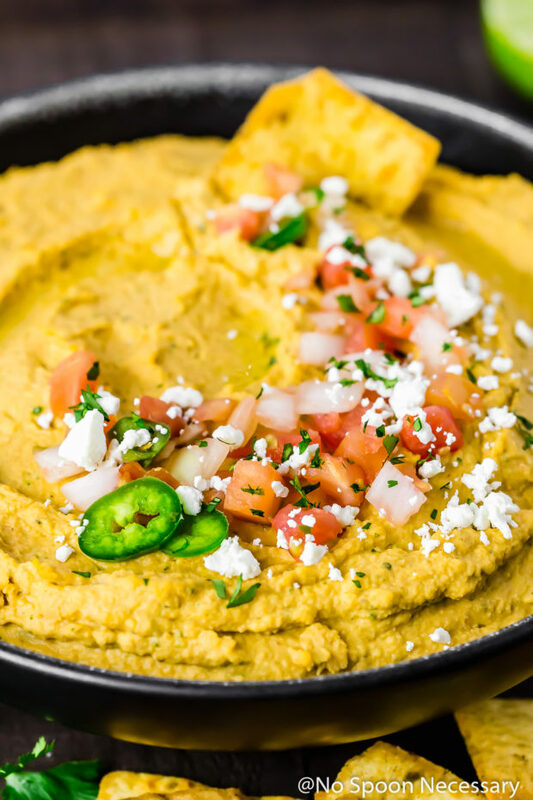 The recipe below for this fajita hummus includes making your own fajita seasoning. DIY fajita seasoning is SUPER simple to prepare! 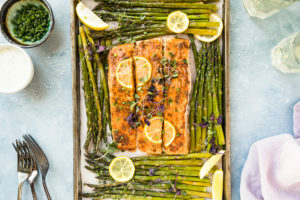 The seasoning mix simply requires stirring (shaking or whisking) a few pantry spices, such as onion powder, smoked paprika and chili powder together. However, here we are going to add those fajita seasoning ingredients directly to the food processor bowl, making life even MORE simple! Making your own fajita seasoning mix, or any prepared seasoning mixture, allows you to customize the mixture to your own tastes and control the level of salt. For example, if you like things spicy – use more chili powder! I like to make a large batch of fajita seasoning and keep it on hand in my pantry. However, you can absolutely substitute a store bought, prepared fajita seasoning packet for the dried spices in the recipe below. I always state in recipes that garnishes or toppings are optional, but in my (humble) opinion they aren’t really. Especially here. 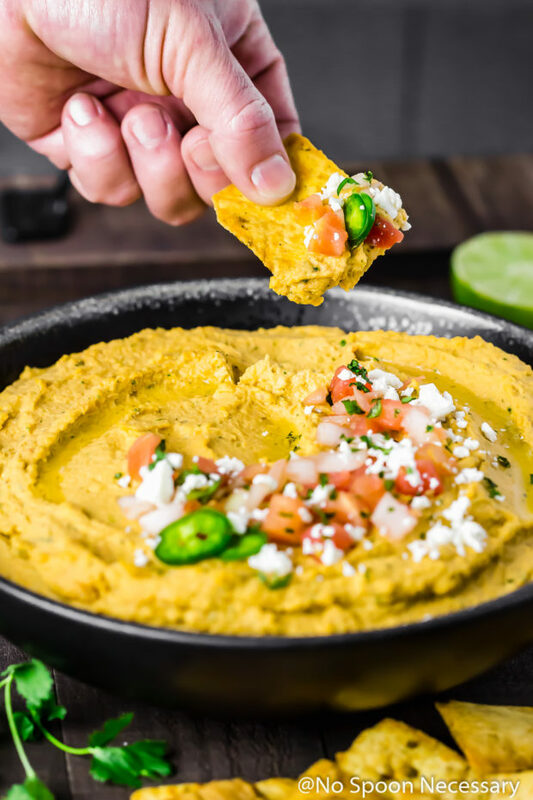 The jalapenos, cotija cheese, pico de gallo and fresh cilantro really elevates this hummus to the next level of yum and enhance the fajita flavor. So, what is optional is how heavy handed you are with the toppings. I like my hummus to have a thicker consistency, so I slowly add in about 7 tablespoons of the chickpea cooking liquid. For a thinner hummus, add more chickpea cooking liquid, one tablespoon at a time, until desired consistency is achieved. If you didn’t heed my request to slow cook your own chickpeas, you can use the liquid in the can and/or olive oil as a substitute for the chickpea cooking liquid. So whether you love or loath chickpeas, I can guarantee you are going to want to devour all this fantastically flavorful Fajita Hummus. Plus, I made something seriously delicious with this hummus, so be sure to come back on Thursday and check it out! 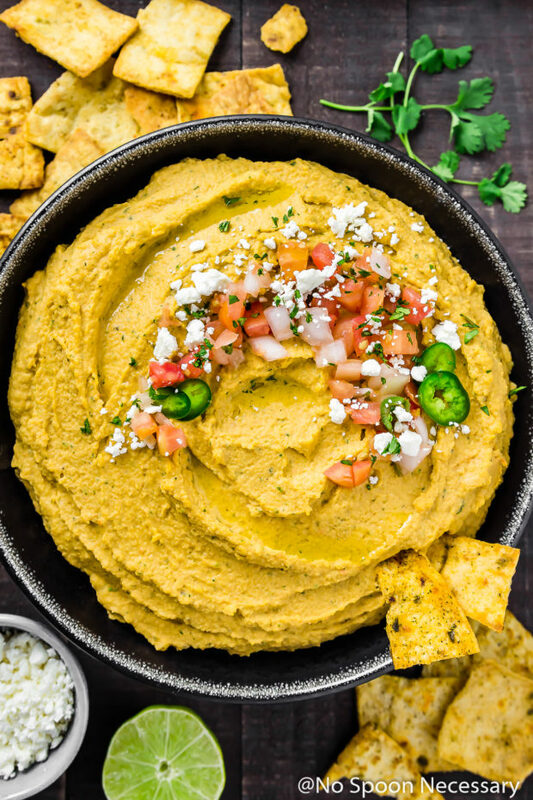 Savory, smoky and slightly spicy, this Fajita Flavored Hummus tastes like everything you love about fajitas, just blended into healthy, creamy, dreamy dip form! OPTIONAL IF USING DRIED CHICKPEAS. Cook the Chickpeas: (*Do Not Soak) Place 1 1/2 cups of dried chickpeas in a slow cooker. Add 32 ounces of water* (or vegetable stock), ½ onion, and 1 teaspoon of salt. Cover slow cooker and cook on high for 3 hours. Drain, reserving 1 cup of the cooking liquid. Discard onion. (OPTIONAL IF USING DRIED CHICKPEAS) Transfer the chickpeas to a large clean kitchen towel of paper towels, and dry, massaging the chickpeas gently to remove their skin. 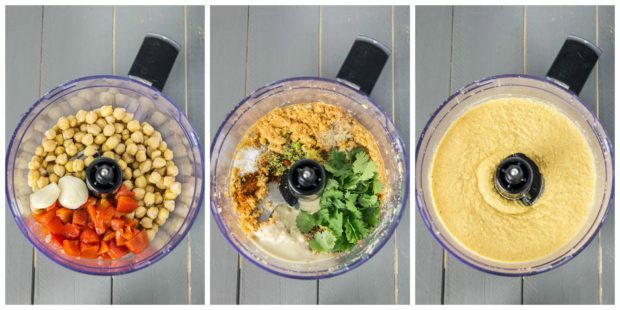 Transfer chickpeas to the bowl of a food processor. Add cloves of garlic, cilantro, roasted red pepper, and 1 tablespoon of chickpea liquid. Process until chickpeas resemble wet sand, about 2 minutes, stopping to scrape down the sides of bowl as needed. To Serve: Transfer the hummus to a serving bowl, drizzle with a bit of extra virgin olive oil if desired, and top with desired garnishes. 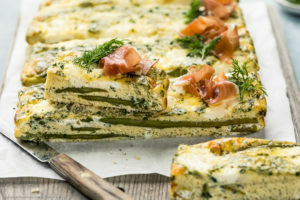 Serve with pita chips and enjoy! 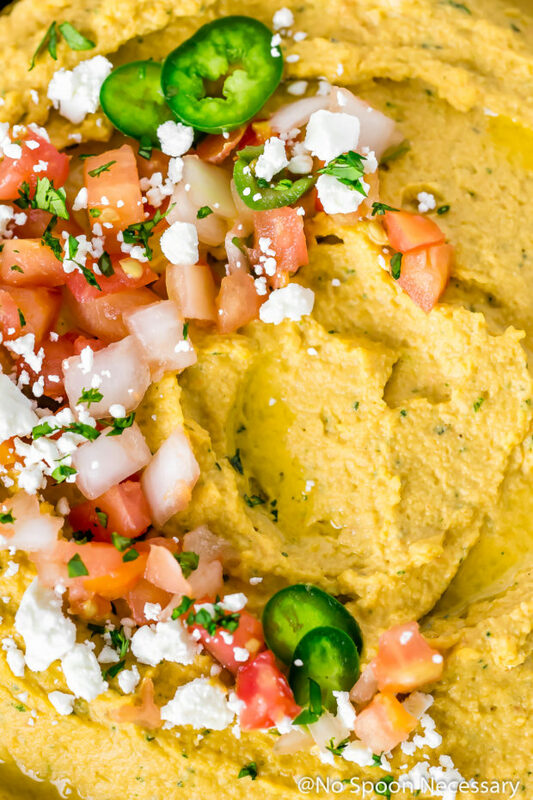 For a bolder flavored hummus, use only 1- 1 1/2 cans of chickpeas as opposed to the full 2 cans. If using dried chickpeas, there is no need to soak the chickpeas, they will cook and become tender in the slow cooker. You can use a combination of half water and half vegetable stock when cooking the dried chickpeas, or just water, or just stock/broth. If using canned chickpeas, skip step 1 & 2 of the recipe. If using jarred prepared roasted peppers, make sure to pat the peppers as dry as possible. I used about 7 tablespoons of chickpea cooking liquid in the hummus. DIY fajita seasoning mixture = the onion powder through the cayenne pepper in the recipe + 3/4 teaspoon of salt. 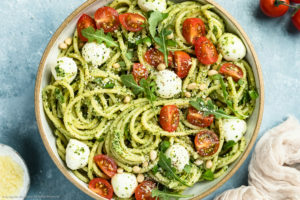 I like to make this separately in a small bowl, double the recipe and keep the other half in the pantry to have on hand. Preheat oven to 350 degrees F. Line a baking sheet with parchment paper. Cut the pita into 8ths and place on prepared baking sheet. Combine oil through ground pepper in a small bowl. Brush both sides of the pita with the oil mixture. Bake for 10-12 minutes or until golden brown. Allow to cool slightly before eating. So glad you republished this – a reminder to make this a must try with game season coming up in 2 weeks! Hoping you have been having a wonderful summer, Cheyanne. 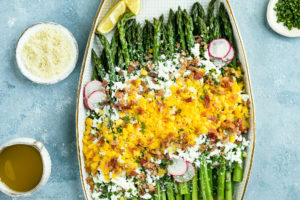 So glad you republished this – a reminder to make this a must try with game season coming up in 2 weeks! Hoping you have been having a wonderful summer, Cheyanne! I’m embarrassed that I still use canned chickpeas!! I totally have to try the slow cooker method. My boyfriend feels the same about chickpeas and I just don’t understand it LOL. 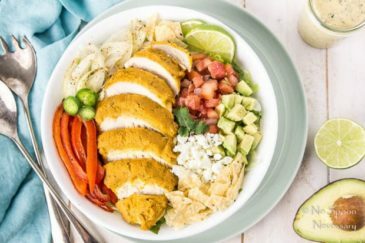 This sounds just amazing – loving the fajita seasoning! Your recipes like fine wine – getting better with age, Chey! 😉 Two years have passed since I saw it first time, and this looks and sounds even better today! Pass me a huge spoon, please! You know this is my favorite right?? I’ve made it for so many friends and it’s always a hit!! Time to make it again! The flavor combo in this sounds amazing Chey!!!!! Super yummy. I’ve been MIA for awhile, but I love your new format here! You’re truly the hummus queen, Chey! Hummus is easily one of my favorite snacks and all I want right now is a bowl of this and some chips. It looks SOOO GOOD! PS, I’ll eat any hummus Boy passes up. Just send it my way! I absolutely love your photos, especially how you present the dip. 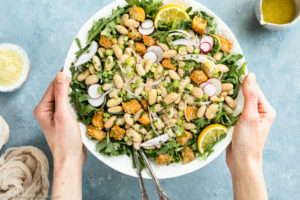 Have you ever used white beans like great northern instead of chickpeas? They’re much smoother. Chickpeas can sieze up and become mealy, but great northern don’t. Just an idea. And you don’t really need the tahini if you’re calling it a white bean dip. Then you can flavor the beans however you want, like your fajita seasoning, which is brilliant!